-It'd be nice if people would just wear maize on their own, but some people wear what they like to wear, some people like to wear the jersey they spent at least $50 on, and sometimes it's too damn cold to worry about putting a maize t-shirt over your winter coat (and it's not like most people have a maize jacket). Also, since the Maize/Blue Outs of the past have been colossal failures, I imagine that people just figure "No one's going to be wearing Maize anyway, so I'll just wear my David Terrell throwback". It's kind of a Catch-22 in a way. People would wear maize as long as other people are doing it, but no one will do it because most people aren't doing it. What's a good way to jumpstart that? Give away shirts. -It doesn't strike me as a very good promotion when you depend on the fans to do everything. If your entire marketing campaign for the year revolves around "Go Blue, Wear Maize" then why not try to facilitate it? It's like they're trying to do things half-assed. They'll promote it, they'll put it on the schedule posters, the press releases, on WTKA, but when it comes down to it, they're depending on the fans to make it work. Either go all out, or don't try and have the thing every year. -A press release does nothing to get the message out to everyone. A good portion of our fanbase is, how you say, old. I'm guessing they aren't checking mgoblue.com all that often. Hell, I'm as big of a Michigan fan as you'll find and I don't even go there during the offseason (and I hardly go there for football news--non-revs and hockey, yes). They finally wised up and put it on the ticket itself as a nice reminder before you head out the door--I've only been campaigning for that for like 4 years now, amazing they didn't give me a job down there...I wasn't "ex-athlete" enough, I guess. -I believe the real reason they don't give out 111,000 shirts is quite simply, the M-Den would be pissed. Who would buy a t-shirt that day if they were going to be receiving one for free anyway? Lost in all the hoopla surrounding Junior Hemmingway's commitment and Marques Slocum being allowed to enroll at U of M is the defection of another Michigan hockey player: This time it's Tyler Swystun, who will be taking his game to the WHL next year. Combine that with the losses of Trevor Lewis and Zac MacVoy, and suddenly the Wolverines are down to 11 forwards for next year, and are faced with moving David Rohlfs back to forward (again) or--as Mel Pearson said in an interview with Rivals--perhaps Jack Johnson? "We have a lot of depth on defense, and I don't think it's impossible to imagine a scenario where a few of our defensemen see some time at forward," Pearson said. "Certainly, we feel that [sophomore defender] Jack Johnson could be one of the best forwards in all of college hockey, if we decided on something like that." Now, as fun as it would be to see someone up front with Jack's speed, offensive skill (remember that move he put on Nick Lidstrom in the USA/Wings charity game? ), and ability to go into the corners, I still think that for this team to be successful, they need to worry more about playing solid defense than they do about scoring goals. A better defensive effort out of everyone will go a long way toward helping Sauer's confidence. I really think that kid can be a darn good goalie if he can get some help in the early going. As far as Swystun goes, apart from the depth issue (and the "Who the f--- is going to play for us in the GLI" issue) he's not a huge loss. I know, I know....he came in a year early and the book was that he needed one more year. But you would think that the kid would show something last year, and apart from the one weekend against LSSU, he never really flashed anything to show that he'd be more than an average player. And at this point, when it's a very real possibility that he could be a bust in college hockey, I'm sure they'll gladly take that scholarship back (and maybe try to find a couple defensemen for next year). It's hard to complain too much about this being another "Michigan summer" since we've lost two players from the current roster and our top recruit. We came into this last season thinking that Hunwick was gone for sure after his junior year, Hensick & Johnson were huge question marks to come back, Cogliano was a dark horse to go, and after the draft the possibility was there for Summers and Mitera. With not even 2 weeks til classes, all those guys are still here which makes me a happy camper. And if both freshmen D can come in ready to contribute, that will allow the coaches to do a lot of things as far as who they move up front. And that'll make me a happy Kampfer. Bad pun, bad pun. Charles Woodson is looking forward to returning punts again. I am looking forward to seeing Charles Woodson return punts again. Rivals poster PacificBlue has created a highlight reel of Michigan playmakers (Howard, Woodson, Edwards, Perry, Carter) set to the tune of Tupac's "Until The End of Time". Freaking awesome. Out of all those highlights, I gotta say that Howard's diving grab against Notre Dame is my favorite. Obviously Carter's catch has the Ufer clip, Edwards led the greatest comeback, well, ever, and Charles Woodson had the most amazing pick I've ever seen. But that Howard catch...man. When I was little and I'd play football in my backyard, I'd tell my dad to throw it jusssssst beyond my reach, so I could pretend I was Desmond Howard and lay out to make the grab. Great work out of PacificBlue. This clip is outstanding. You can't get too high or too low during these scrimmages. If the offense does something well, should you be excited because they made a play, or upset because the defense didn't do well? If the defense creates a turnover, is that a cause for celebration or alarm? The one thing that is definite however, is that it is damn good to have football back. I got chills seeing Favre run out of the tunnel. I'm beyond happy that he came back for another season. -Cory Rodgers is fast. You might say he's as fast as a speeding bullet shot into the air. There's not a lot of things in football that are prettier than a WR catching a slant and pulling away from the defense for a big gain. -I can see what the hype of Greg Jennings is all about. He runs nice routes, has good speed, catches it with his hands. They've been raving about him all week. -Abdul Hodge is a beast. I still can't believe he was there in the third round. He had 9 tackles during the scrimmage tonight and he absolutely popped the 90th string running back behind the line of scrimmage. -AJ Hawk was quiet. I'm sure he was still getting his head around things, and he obviously has a nose for the ball, but he didn't make any plays of note that I can recall. -Aaron Rodgers throws a really nice ball. He was victimized by drops early on, but he had one absolutely gorgeous touch pass that he dropped in over the DB. I also don't see what the concern over his arm strength is about. He looked like he threw with some pop. -Noah Herron is really fast too. Wouldn't surprise me a bit if he makes the team over Poop Davenport. Gado looked good as well. -Really happy that Nick Collins didn't hurt himself. He slipped on some concrete on the sideline by the stands and went feet first into the metal railing and landed hard on his tailbone. Thankfully it looked a lot worse than it was. -My big concerns are with Left Tackle and Kicker. LT is fine with Clifton in there, but with Kevin Barry and Adrian Klemm already out for the year, the depth on the line is suspect. Junius Coston played out there tonight. Baring in mind that he has only had 2 practices at LT, if he plays like that, he's going to get Brett Favre killed. KGB just abused him. Both the kickers missed FGs they need to make, especially being that conditions at Lambeau won't get better than they were tonight. Edinger was in for a workout this week, and neither Cundiff or Rayner did anything to keep the GM from looking at other kickers. -Disappointed that Woodson didn't play because of a hip flexor injury, but it sounds like it's a very minor injury so I'm not worried about it. Overall I was impressed with the increase in team speed on defense. They looked a lot faster than a year ago--though that could also be that I haven't seen football in awhile. If they get anything out of the offensive line, I think that they could be a surprising team this year. The defense was pretty good last year and they've improved all three position groups. I can't wait for the season to get going. Two of my favorite things returning this week. Yesterday--in a shocking move being that the week before they stated he was no longer an option--the Red Wings re-signed goaltender Dominik Hasek. I give Ken Holland a lot of credit for making this move, though part of that is tainted by the fact that it seems he picked Belfour over Hasek, Eddie just wanted more in bonus money. Belfour would've been a huge mistake. Thankfully he's in Florida and we got the guy I've wanted for over a month. It's really a brilliant move. The best part of this signing is how much the Osgood fans absolutely despise it. The linked thread is long, but it's worth it, if for nothing more than to see Eva Unit Zero's post that says that Osgood was better in the 98 playoffs than Hasek was in 02, and that Osgood is the better goalie now. Stuff like that is just priceless. If he gets hurt, the money doesn't count against the cap and we can make a move at the deadline (As of right now, Anaheim, SJ, Buffalo and Montreal all have guys they'd like to move) and even if we don't, we're no worse off than we were yesterday morning. In the meantime, Howard is going to get to start a bunch of games in the AHL and he'll be ready next year when Hasek will theoretically be gone. If he stays healthy, this team is fully capable of making a run at the Cup. Suddenly, the Red Wings are once again a team that no one wants to play. According to Hasek, he doesn't care if he only plays 40-50 games. He's just interested in staying healthy for the playoffs. That's great to hear from a guy that in the past has wanted to be in net every single game. Ottawa overplayed him and he ended up getting hurt. Plus, there's no Olympics this year, which means the schedule won't be as compressed. I like the Markov signing as well. Again, he's an injury risk, but he's just the type of defenseman that we needed. And on a one-year deal, there's not a whole heckuva lot of risk. It's alarming that he's on his 5th team in five seasons, and that he doesn't put up the offensive numbers that a guy like him probably should...but he'll lay licks on people. He actually sounds very similar to Kronwall. Gotta stay healthy though. That sures up the defense corps, and may actually give them some flexibility if they decide they want to move Schneider. Once again, the Wings will have one of the absolute best groups of defensemen in the league. Only this time, they've got an elite goalie behind them. I went from about a 2.2 on the "excited for next year" scale to needing a Spinal Tap scale that goes to 11 in one day. We just got the best goalie of all-time again, he's coming for a tenth of the price of his first stint in Detroit, and most importantly, we have outs should we need them. Football is also going finally, and the Packers have already lost two of their backup offensive linemen for the season: Kevin Barry and Adrian Klemm. Not a great way to get things rolling, but football's back and I'm geeked. The NFL Network is showing Green Bay's intrasquad scrimmage this weekend, and it's going to be just amazing to see those green and gold uniforms again. Favre called this the "most talented team" he has ever played on. He clarified that the 96 team was obviously better, but that was more because of experience rather than talent. 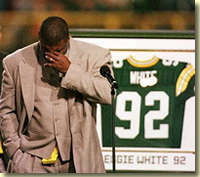 Still, I think I'll take a team with Reggie White, Sean Jones, Santana Dotson, and Gilbert Brown in their front four. The 1996 team was the first team since the undefeated Dolphins team to lead the league in points for and fewest points allowed, and I want to say ESPN had a study that showed they were the most dominant team in NFL history. I do agree with Favre that they're going to be a lot better than people think. The linebacking corps went from a weakness to a strength with the additions of AJ Hawk, Abdul Hodge (He really could be the steal of the draft), and Ben Taylor. They led the league in fewest passing yards allowed, and added Charles Woodson and Marquand Manual back deep. I'm really looking forward to this season, and even if things fall apart again, I'm still going to just enjoy watching Brett Favre for one more year. There's never going to be another Favre, and it's time to just savor watching him while I still can. And December 21st I'll be at what could very well be his last game at Lambeau Field. One last thing: We haven't heard too much about Pat Kane's upcoming decision, but Bret from GBW says that he's heard about some potentially positive factors that are in Michigan's favor. At the other end of the spectrum, the Evilanche have been in contact with Hensick. That'd be bad.